In September, The UOS Times visited the Seoul City Wall. Our first visit was to Naksan Mountain Trail and the view was so fascinating that we decided to walk the rest of the wall. 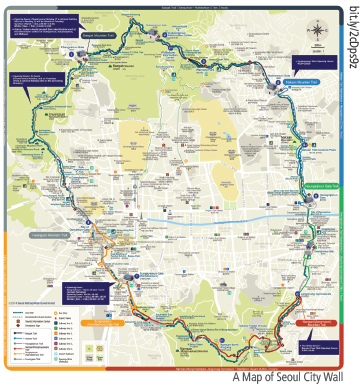 The Seoul Metropolitan Government has divided the visit route into six parts, from the Baegak trail to the Inwangsan trail. With each trail having its own individual characteristic, visitors will never be bored. Since the roads are not short, walking only one route per day is highly recommended. Some routes are fine for walking alone, while others are best enjoyed with a friend. Let’s begin the journey! The Fortress Wall of Seoul is located around the old part of Seoul, which is much smaller than the present city. 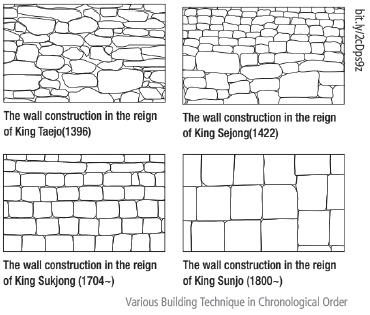 In order to protect the capital from enemies, ancestors built a city wall around Seoul. Over time, some of the wall was destroyed and then later repaired, creating a cultural heritage site. The wall’s construction was completed in the fall of 1396. Its entire construction took about 100 days. After this, a lot of repairs took place, making the wall strong and solid. The wall functioned as a city boundary for about 500 years, making it the world’s oldest structure of its kind. 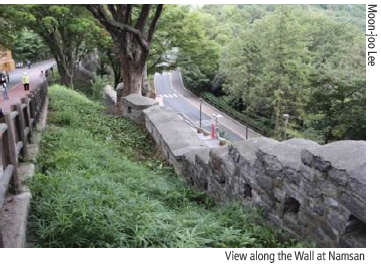 Since the wall has undergone several revisions, we can see a footprint of history just by looking at it; these include the various building techniques displayed in chronological order along the trails. The wall suffered enormous damage with the start of the modernization period, about 100 years ago. However, it has since been heavily restored ? about 70 percent of the wall is available for us to see. The wall was put on UNESCO’s world heritage tentative list in 2012, demonstrating a strong resolution to keep it in place. This route is the most special. First, unlike the other trails, it feels more like climbing a mountain. While the other trails have a mild slope, this trail runs along a steep ridge. Therefore, wearing hiking sneakers is highly recommended. The main benefit of this trail is the scenery from the top. When you look down, you can see Gwanghwamun Plaza and traditional palaces in one sweeping view, displaying both old and new aspects of Seoul. However, since it is on a mountain adjoining the Blue House, the Korean presidential residence, some photos are restricted. There are also other things to consider before entering. You should keep your identification card or passport with you to enter. In addition, entry is restricted on Monday. The course starts at Changuimun Gate and finishes at Hyehwamun Gate and takes about three hours. One of the strangest parts of this trail is that there are men stationed along several sections within the trail. They are conscripted policemen to prevent you from taking unsuitable pictures. These include pictures of the Blue House or CCTVs along the mountain. In such a case, it might be better to take photos at other angles. This is one of the most popular trails as is visited by many tourists. It starts at Hyehwamun Gate and ends at Heunginjimun Gate. The slope is not that difficult, and this trail allows your eyes a pleasant view at various points. While walking down the trail, you will see a lot of citizens exercising. Although this road is good to walk alone, it would be even more enjoyable if you go with your friends. This is because if you go a bit further you can visit the Ewha Mural Village. This place is famous for shops selling small unique ornaments and art galleries. Here, you can try on an old uniform and snap a photo of you wearing it with your friends. Many foreigners are fond of seeing the murals here. This route starts at Heunginjimun Gate and ends at Jangchung Gymnasium. If you are planning to start at Heunginjimun Gate, it could be hard to find a way because this portion of the wall has disappeared. Therefore, finding the water gate would be the easiest way to begin your visit. The existing water gate has been restored and is not in the original location. Previously, it was under the old wall, allowing for the flow of water. 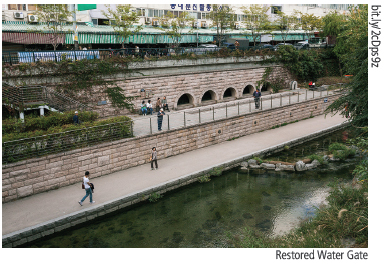 However, the old wall has since been lost, and the restored water gate was moved next to Cheonggyecheon Stream. If you are going to visit this place, finding some information about reasons behind the DDP’s location ? including what existed there before ? and then tracking the remaining trace would be more meaningful. Namsan Mountain Trail is between the Heunginjimun and Sungnyemun trails. If you are out of shape, then taking a cable car or shuttle bus is not a bad idea. 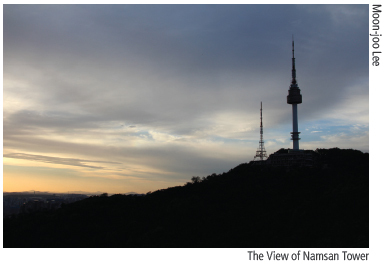 However, in October, the trees on Namsan turn bright red and yellow, so walking up to the tower at this time will provide you with a beautiful view. Seeing the wall adorned with red and yellow leaves would be fabulous. 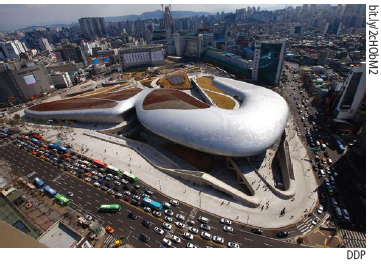 The trail starts at Jangchung Gymnasium and ends at Baekbeom Square. On the way to Baekbeom Square, you can see Ahn Jung-geun Memorial Hall. Stopping by there and learning about Korea’s history would be another great way to enjoy this short trip. On this trail, if you don’t pay attention, it will be hard to notice that there is a wall at all. The wall has not been preserved in its past form. Instead, it exists as cornerstones in buildings or without any trace whatsoever. Since this trail is in the middle of downtown, restoration was practically impossible. If you are planning to walk surrounded by history or nature, this trail is not recommended. If you have the time, it would be helpful to prepare for this trail by studying the history of Korea’s open-door policy during the 19th century. Without any preparation, walking this trail would feel the same as taking a stroll down the street. 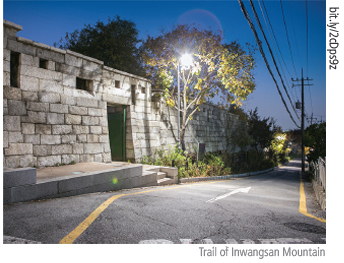 The trail starts at Baekbeom Square and finishes at the site of Donuimun Gate. You should at least bring a map to avoid getting lost. This is the second hardest of the six trails. Similar to Baegak Trail, Inwangsan mountain trail is more like climbing rather than strolling. However, unlike Inwangsan, there are no policemen, and therefore no restrictions in taking pictures. The trail starts at the site of Donuimun Gate and ends at Changuimun Gate. Since this walk also goes high up into the mountains, it affords you another opportunity to look down on the city of Seoul. When you stand atop the mountain, it feels like you own the city. At this view, you can see Namsan Tower within the entire horizon of Seoul and really notice how small Seoul was in the past compared to present day. Our walk took hours but the trails were well worth it. If you decide to walk the entire trial, you will never regret it. 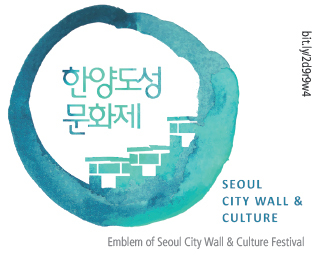 Furthermore, the Seoul City Wall & Culture Festival will take place from October 14th to 16th. Enjoying the trail and participating in the festival would be unique experiences. Other than the festival, when you visit the trails you can collect stamps for each trail walked. After collecting all the stamps, you can receive a button. Whether you walk the entire length of the trails or not, why not head outside and learn something new about Seoul this October?